A bowing effect that directs the performer of a string instrument to pluck the string away from the fingerboard with the right hand with sufficient force to cause it to snap back and strike the fingerboard creating a snapping sound in addition to the pitch itself. This is notated by the circle with an upwards line symbol shown over the note. This effect is also known as the Bartók pizz, named after composer Béla Bartók from his use of the effect in his 4th String Quartet. 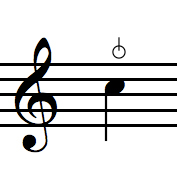 A similar technique (although not used in classical music), called slap bass, is used on the double bass in jazz, swing, polka, bluegrass, Rock n' Roll and other music genres. This slap bass technique, although similar, is somewhat different in character to the current Funk style of slap bass.